The Short Version: Reds lose their final game of the 2018 season, closing out yet another miserable campaign. –Sal Romano was effective in five innings of work, allowing just two runs on three hits and throwing only 59 pitches. –Billy Hamilton doubled, stole a base, and scored a run. Dilson Herrera and someone named Tim Federowicz hit homers. –Matt Wisler and Jackson Stephens and Amir Garrett weren’t particularly good. Of course, Stephens wasn’t helped when a ball that should have been a single was misplayed by Gabby Guerrero into a three-base error. The game winning run scored soon thereafter on a Stephens wild pitch. 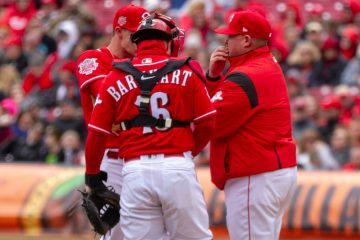 –The Reds finished the 2018 season with a 67-95 record, one game worse than the last two years. –The Reds did a nice thing by removing Joey Votto, Billy Hamilton, and Eugenio Suarez so they each got a nice ovation. Votto and Hamilton removed their jerseys and gave them to fans, while Suarez tossed his cap into the crowd. –I watch the Reds more closely than almost anyone, but I can guarantee you that I’ll be looking at the 2018 Reds page on Baseball-Reference five years from now and I’ll have no memory whatsoever of Tim Federowicz. 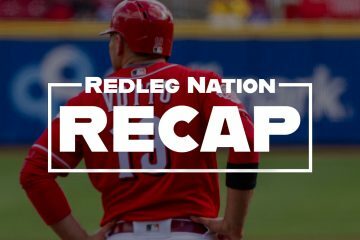 –As we close out our 14th season covering the Reds, permit me to express my gratitude to each of you who keep coming back to Redleg Nation to talk about this team, even during one of the worst stretches in the history of the franchise. Sure we all get frustrated, but it’s fun having a place to talk about the team with other (usually) like-minded, obsessive fans. Thank you for hanging in there with us. Presuming the Reds ever make it back to the playoffs, you all are going to get the best seats on the bandwagon. And it’ll be even sweeter because you were there during the bad times. Is this the last time that Billy Hamilton sees the field as a Cincinnati Red? 178 days until the Reds begin their 2019 pennant chase. Of course. Extra inning of this garbage. The baseball gods can be so cruel. I was thinking, “of course the season ended on a wild pitch.” DFA Jackson Stephens should be on the winter to-do list. The only word I can think of is Ã¢â‚¬Å“sadÃ¢â‚¬Â. But not because the season is over. IÃ¢â‚¬â„¢m grateful itÃ¢â‚¬â„¢s finally finished. This franchise is sad. Very sad. This was my 20 th game I went to this year. By far the best weather day all year. I know attendance was down this year but at least part of it was because the weather in Cincinnati sucked this summer. The on-field product left plenty to be desired as well. It did, and may have actually caused most of the bad weather. It was a gorgeous day. I may have made it down had I not been helping out my fiancee at an art show. Chad, thanks for all you do for us. I know it’s a lot of work and at times seems fruitless. But, you provide a great place for a whole lot of fans to share thoughts and just plain have fun. It helps to vent a little during these miserable seasons.It is greatly appreciated. Make that ^7 – thanks, buddy! I will second that .Thanks to Chad and all of the correspondents who make this site a must for me every single day ! I second or third that. Thanks to everybody. This year was all kinds of rough, but I thank those at Redleg Nation for the great work that you all do. I didn’t comment much (at all?) this year mostly because the Reds weren’t worth commenting on…but I still kept up with the site and all the great articles. I’ve enjoyed other people’s banter – and hopefully sometime before I die I’ll get to see another great Reds team. Thank you, Chad and Steve and all the other writers, for hanging in there with us. We know it takes a lot of work to keep this great blog going. Hang in there, Reds fans, better days will come. This terrible season was made bearable by all the great writers here at Redleg Nation. And all the commenters in this section, it was great having somebody to share the pain. Here’s to 2019 and the hope that springs eternal that the Reds Front Office will actually do something this offseason to improve this team. Old Yeller has finally been shot. Mercifully. Never have I had so much apathy about my favorite baseball team. This organization needs a miracle (like the trade for Greg Vaughn in 1999) for 2019 to be in any way compelling. Thanks Chad and team, as well as my fellow RLN fans. You made yet another unbearable season….bearable. IÃ¢â‚¬â„¢m going to look to the positive and say Ã¢â‚¬Å“at least we moved to #7 in the draft from 8thÃ¢â‚¬Â. Had we stayed pseudo hot and finished 15-18 in the draft, I would not have felt any better about this year, but our picks would have been much worse. IÃ¢â‚¬â„¢m also going to hope that this utter collapse of the team these last few months will force the FO and Big Bob to wake and up and realize that they need to make bold changes, invest in pitching, and stop playing favorites to Bob or they are going to play to 5k fans/game. Looking forward to articles on here about targets for next yearÃ¢â‚¬â„¢s draft, exciting prospects that could make the team next year, what we should do with Billy (DFA? ), Scooter, Homer, etc as well as whom we should sign/trade for this offseason. See you all in Arizona next March! This was not a very good Reds team, but I will say they played in a couple of the zaniest baseball slug fests I have ever seen. The season results were a drag, but those few games were really fun and memorable, especially the come back against the Tribe. That one they lost to the Brewers too was just totally insane too. An OF that fell apart months into the season but otherwise healthy lineup with great offensive years (compariatively) from the IF excluding Votto who was fine outside of a power outage. As for the OF a late push by Ervin was a pleasant surprise. A rotation that was overall much healthier but made almost no improvement. And a solid if not great (and somewhat unnecessary bullpen). Could ask for and managed a losing team during his tenure. The front office needs to try something different. Drastically so. This was a year of missed opportunities in terms of sales and repositioning. I truly love RLN and its writers for helping to keep a west coast Reds fan in touch with the team. Love coming here and seeing all the comments from others obsessed, too. Thanks again for an engaging season and let’s keep our fingers crossed that we even though it means nothing, maybe just maybe we can win the off-season! Another year of terrible Ã¢â‚¬Å“Winning CultureÃ¢â‚¬Â baseball, balanced against another excellent year from Redleg Nation. Now itÃ¢â‚¬â„¢s in to checking Doug GrayÃ¢â‚¬â„¢s 2019 Draft evals once Spring Training rolls around. The Reds will continue to waste Joey VottoÃ¢â‚¬â„¢s HoF career until Big Bob quits his meddling and Jocketty to retire in fact. Until then the Reds will be cellar dwellers. Thanks to the entire RLN team for everything you do. 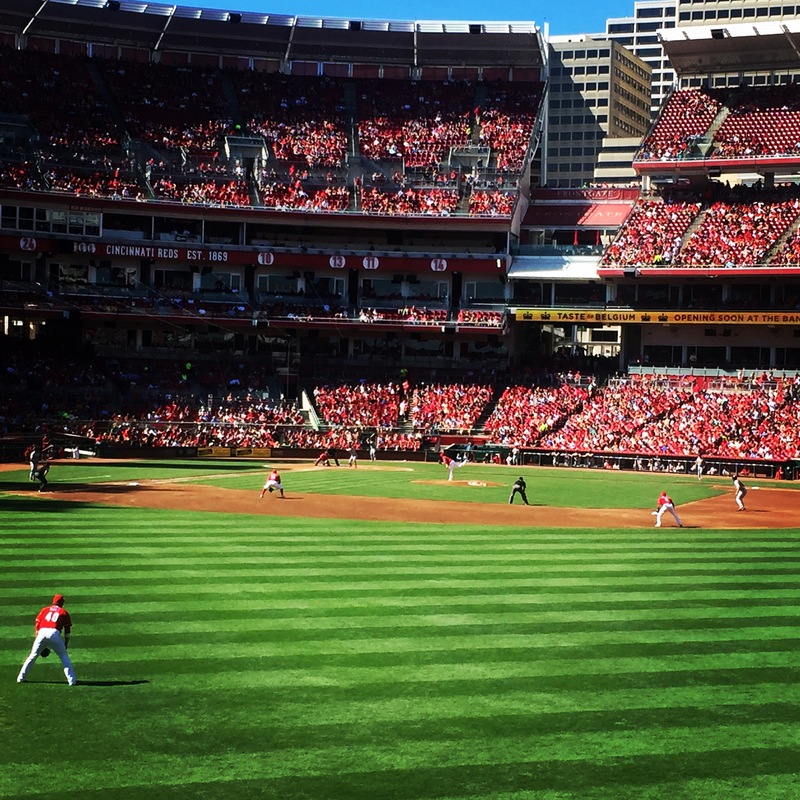 These are dark days for Reds fans–probably the darkest in my 30 years of fandom. Not sure why we all keep coming back, but boy this is a great place. Woohoo. Moved up one in the draft order! Would like to echo everyone else and thank the writers here for all that they do (and put up with) and the other commenters for helping to share in Reds fandom. For good or bad. Helps keep someone out in the Pacific like myself connected to what’s going on with the team I’ll forever be stuck rooting for. DidnÃ¢â‚¬â„¢t do it earlier but I too want to thank all the writers of RLN and also all those who come here and post. It was the only bright spot of a long miserable season. Who dey. Bearcats. FC Cincinnati. Thanks to Chad, Steve, the authors, and most of the posters for another great year of RLN. IÃ¢â‚¬â„¢ve not posted much this year but have read the site nearly every day. Misery loves company. My dad was a Reds fan so one of my earliest memories is hearing Waite Hoyt broadcast the games. I was more or less born a Reds fan. The team is in a hopeless situation until ownership changes or at least changes its approach. With the present approach, GM, and field manager, weÃ¢â‚¬â„¢ll see bright spots here and there but the 90+ loss streak will continue. Say it ainÃ¢â‚¬â„¢t so, Bob. This is always a sad day in a non-playoff year, which lately means every year. No more Reds baseball for six months. Thank you Chad to you and all the staff at RLN, to all the contributors and all my fellow fanatics. You all make being a Reds fan more interesting, more gratifying, and more challenging (in a really good way). Thank you! Agree that the only thing worse than losing baseball is no baseball. Woohoo! Up to 7th draft spot! The Cincinnati Red Bengals are winning, again! And anyways, the people that all write here deserve a big hand for all that they do, despite how actually bad the Cincinnati Red Bengals have been. Let’s see what the Red Bengals can do with that one step up in draft choice. Maybe a real high school phenom that is 5 or more years away from helping the Reds, or some top rated college guy, Or something. Yay Reds Bengals!! I don’t post often, but I wanted to thank the writers and those who comment on this site. It’s been four years of bad baseball. If they can trade for one young, number two or three type starter, and some of the young crop of recently drafted kids come through, maybe the reds can win 75 to 80 games next year. I can dream, can’t I? Thanks to redleg and red reporter. You deserve an award of some kind having to watch this crap. all this season did for me was confirm they are closer to starting over then to being competitive. The idea that disco would be good if health proved erroneous. So they now need basically three maybe even four just league average HEALTHY pitchers to even start being .500. not sure they would expand payroll knowing it’s just another 90 losses. And not sure a good pitcher would sign here. Also not sure a good manager would want the job so riggelman or Farrell it is. Giving up alot of prospects just for one starter doesn’t seem prudent given the amount of holes the roster has. Wow. I think I just talked myself into starting over. .
Obviously there is at least a month before we have to worry about it but, when making deals the FO needs to remember 2 things 1. NO “no trade clauses” 2. Long term deals for pitchers need to come with the Lackey clause, where significant DL time, expecially to the Throwing arm, reflect in a reduction of salary for the next season. Look on the bright side, we can start pretending we are 0-0 again. Wow. Chad this was my 50 th year as a die hard Reds fan. Thank you and your team for keeping me engaged. Love the post game summaries. And I listen to every podcast. Thank you. Better days ahead. Have a great post season.